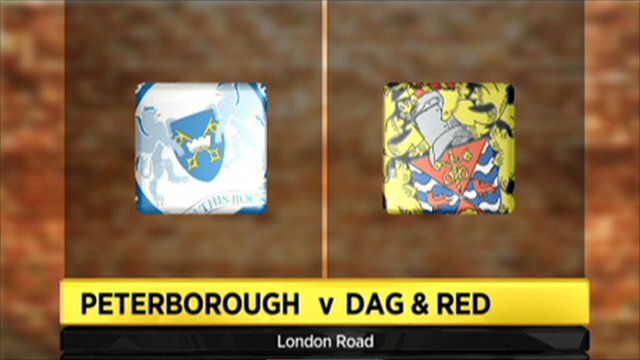 Dagenham & Redbridge have made an immediate return to League Two after a heavy defeat by play-off bound Peterborough sealed their relegation. Nathaniel Mendez-Laing put Posh ahead when he slotted past the stranded Tony Roberts, before Darren Currie twice hit the post for the Daggers. Grant McCann drove in to double the lead and George Boyd fired in a third. Craig Mackail-Smith and David Ball both scored late on to round off a miserable afternoon for the visitors. The Daggers needed at least a point to have had any hope of avoiding relegation to League Two. Just a draw would have seen them avoid the drop and Walsall, who lost 3-1 at Southampton, instead being relegated on goal difference. Dagenham had plenty of chances to pull level in the first half when John Akinde was twice denied by Posh goalkeeper Joe Lewis and Romain Vincelot headed over. Peterborough, who will face MK Dons in the play-offs, bossed the majority of the second half, with Tommy Rowe and Mackail-Smith also going close. Vincelot and Jon Nurse both headed wide for Dagenham, who were well beaten in the end. They now drop back into League Two, just a year after gaining promotion via the play-offs to the third tier for the first time in their history. "This win sets us up perfectly for the play-offs and should give us a lot of confidence. "It's never really mattered who we would play because I feel that if we can play to the best of our ability then we will win. "That's not me being arrogant, it's what any manager would say. I'm really looking forward to the next couple of weeks." "We didn't go down today, it's been over 40-odd games, but week after week we have got the maximum out of what we have. "For our resources we have amazing quality, every year we sell players as that goes to show. "I think we do produce quality and now we have to find the next lot and I'm proud of what we do. "I haven't got too much to do, I know exactly what I'm doing, and relaxed about the close season." 90:00+2:49 The referee blows for offside against Craig Mackail-Smith. Free kick taken by Tony Roberts. 90:00+1:54 The ball is delivered by Darren Currie, clearance by Gabriel Zakuani. 90:00+0:42 Assist on the goal came from Grant McCann. 90:00+0:42 GOAL - David Ball:Peterborough 5 - 0 Dag & Red David Ball gets on the score sheet with a goal from inside the box to the bottom left corner of the goal. Peterborough 5-0 Dag & Red. 89:55 Shot from just outside the area by David Ball goes over the bar. 88:51 Will Antwi challenges Craig Mackail-Smith unfairly and gives away a free kick. Free kick taken by Tommy Rowe. 87:50 Centre by Chris Whelpdale. 86:27 Corner taken by Oliver Lee, clearance by Chris Whelpdale. 85:26 Oliver Lee decides to take the corner short. 85:10 Oliver Lee produces a right-footed shot from just outside the box that misses to the right of the target. 84:05 Jon Nurse is caught offside. Joe Lewis restarts play with the free kick. 83:03 Assist on the goal came from Joe Newell. 83:03 GOAL - Craig Mackail-Smith:Peterborough 4 - 0 Dag & Red Craig Mackail-Smith fires in a goal from close range to the top left corner of the goal. Peterborough 4-0 Dag & Red. 81:14 Assist on the goal came from David Ball. 81:14 GOAL - George Boyd:Peterborough 3 - 0 Dag & Red George Boyd fires in a goal from inside the penalty box to the top right corner of the goal. Peterborough 3-0 Dag & Red. 80:48 Free kick awarded for a foul by Romain Vincelot on Joe Newell. Direct free kick taken by Tommy Rowe. 79:32 Substitution Chris Whelpdale joins the action as a substitute, replacing Nathaniel Mendez-Laing. 79:20 Headed effort from deep inside the area by Jon Nurse misses to the left of the goal. Correction - 76:08 Substitution Oliver Lee joins the action as a substitute, replacing Peter Gain. 76:08 Substitution Oliver Lee joins the action as a substitute, replacing Peter Gain. 75:08 The ball is sent over by Craig Mackail-Smith, comfortable save by Tony Roberts. 74:16 Close range header by Romain Vincelot goes wide of the left-hand post. 73:05 Grant McCann gives away a free kick for an unfair challenge on Romain Vincelot. Free kick crossed right-footed by Solomon Taiwo. 72:42 Peter Gain challenges Ryan Bennett unfairly and gives away a free kick. Joe Lewis restarts play with the free kick. 71:45 Darren Currie crosses the ball, clearance made by Gabriel Zakuani. 70:23 Craig Mackail-Smith is flagged offside by the assistant referee. Tony Roberts takes the free kick. 70:08 Shot from deep inside the area by Craig Mackail-Smith clears the crossbar. 69:30 Jon Nurse crosses the ball, Romain Vincelot takes a shot. Clearance made by Gabriel Zakuani. 68:42 Substitution Oluwafemi Ilesanmi goes off and Danny J Green comes on. 68:42 Substitution James Wesolowski goes off and David Ball comes on. 68:42 Substitution Bas Savage replaces John Akinde. 66:40 The ball is crossed by Mark Little, clearance by Will Antwi. 65:41 The referee blows for offside against George Boyd. Tony Roberts takes the indirect free kick. 64:03 Assist by Nathaniel Mendez-Laing. 64:03 GOAL - Grant McCann:Peterborough 2 - 0 Dag & Red Grant McCann gets on the score sheet with a goal from just outside the area high into the middle of the goal. Peterborough 2-0 Dag & Red. 63:01 The ball is swung over by Romain Vincelot, Gabriel Zakuani makes a clearance. 62:15 Free kick awarded for an unfair challenge on Romain Vincelot by George Boyd. Tony Roberts restarts play with the free kick. 61:30 The ball is delivered by George Boyd, Craig Mackail-Smith produces a header from inside the area that goes over the crossbar. 59:20 A cross is delivered by Romain Vincelot. 59:11 The ball is sent over by Philip Ifil, Tommy Rowe manages to make a clearance. 57:10 Joe Newell takes a shot. Oluwafemi Ilesanmi gets a block in. 56:41 George Boyd takes a shot. Save by Tony Roberts. 54:36 James Wesolowski takes a shot. Save by Tony Roberts. 53:02 Tommy Rowe produces a right-footed shot from deep inside the area which goes wide of the left-hand post. 52:22 Outswinging corner taken by Grant McCann. 50:45 James Wesolowski fouled by Darren Currie, the ref awards a free kick. Joe Lewis takes the direct free kick. 50:17 Jon Nurse produces a cross. 49:11 Corner taken left-footed by Grant McCann. 49:04 Nathaniel Mendez-Laing sends in a cross, clearance by Will Antwi. 48:30 The ball is sent over by Philip Ifil. 47:58 Craig Mackail-Smith takes a shot. Tony Roberts makes a comfortable save. 45:00+3:12 It is the end of the first-half. 43:54 The ball is swung over by Tommy Rowe. 43:40 Tommy Rowe crosses the ball, Oluwafemi Ilesanmi makes a clearance. 42:22 Effort from inside the area by John Akinde misses to the right of the target. 40:26 Jon Nurse is ruled offside. Joe Lewis restarts play with the free kick. 40:06 Effort from inside the area by Darren Currie strikes the post. 39:49 John Akinde takes a shot. Save by Joe Lewis. 38:11 The ball is crossed by Oluwafemi Ilesanmi. 37:16 Peter Gain takes a shot. Save by Joe Lewis. 36:24 Grant McCann restarts play with the free kick. 36:24 Booking Will Antwi booked. 36:17 Will Antwi gives away a free kick for an unfair challenge on Nathaniel Mendez-Laing. 34:15 John Akinde is ruled offside. Indirect free kick taken by Ryan Bennett. 33:39 Peter Gain sends in a cross, clearance by Tommy Rowe. 32:37 Corner taken left-footed by Grant McCann from the right by-line, clearance by Mark Arber. 32:21 James Wesolowski takes a shot. Save made by Tony Roberts. 31:25 Nathaniel Mendez-Laing takes a shot. Save by Tony Roberts. 29:43 Unfair challenge on Peter Gain by Mark Little results in a free kick. Free kick taken by Mark Arber. 27:53 Substitution Joe Newell comes on in place of Charlie Lee. 26:06 Romain Vincelot has an effort at goal from just outside the box which goes wide of the left-hand post. 24:56 Nathaniel Mendez-Laing delivers the ball. 24:34 Solomon Taiwo takes a shot. Joe Lewis makes a save. 24:13 The ball is sent over by James Wesolowski. 24:02 Charlie Lee sends in a cross. 22:48 Craig Mackail-Smith delivers the ball, Will Antwi makes a clearance. 21:42 A cross is delivered by Craig Mackail-Smith. 21:30 The ball is sent over by Tommy Rowe, clearance by Peter Gain. 20:09 Free kick awarded for an unfair challenge on Charlie Lee by Romain Vincelot. Grant McCann takes the free kick. 18:42 Effort from inside the penalty box by Darren Currie strikes the post. 17:39 Free kick awarded for a foul by George Boyd on Will Antwi. Direct free kick taken by Tony Roberts. 15:14 Effort from the edge of the box by George Boyd goes wide of the right-hand upright. 14:14 Centre by Darren Currie. 13:17 Inswinging corner taken from the right by-line by Grant McCann, comfortable save by Tony Roberts. 10:28 GOAL - Nathaniel Mendez-Laing:Peterborough 1 - 0 Dag & Red Nathaniel Mendez-Laing grabs a goal from the edge of the penalty box low into the middle of the goal. Peterborough 1-0 Dag & Red. 9:32 Darren Currie crosses the ball, clearance made by Gabriel Zakuani. 6:17 Grant McCann takes a shot from long range which goes wide of the right-hand upright. 5:33 Peter Gain challenges Nathaniel Mendez-Laing unfairly and gives away a free kick. Free kick taken by Grant McCann. 2:55 Nathaniel Mendez-Laing is ruled offside. Free kick taken by Tony Roberts. 1:16 Tommy Rowe takes a shot. Tony Roberts makes a comfortable save. 0:58 Free kick awarded for an unfair challenge on Grant McCann by John Akinde. Grant McCann takes the direct free kick. 0:30 A cross is delivered by Peter Gain, save by Joe Lewis.